I have never professed to know all there is to know about writing mystery fiction, and as such I rarely try telling anyone how to write. I have, however, collected a set of guidelines, tips, truths, and half-truths over the years that seem to work for me. I shall be imparting those pearls of wisdom later in this piece for you to rummage through, take what you like, or just poo-poo the whole thing as the ramblings of an old man whose is still trying to get the hang of this writing game. But let’s get to what got me interested in writing in the first place. Back in the Stone Age, before there was the internet, before there was TV, there was something called radio. Every day after school I had my regular programs I listened to. Gang Busters. The Shadow. I rode with the Lone Ranger and Tonto; help solve cases with Richard Diamond and Johnny Dollar. The more intense the stories got, the closer my ear got to the radio speaker. I remember once I’d hit my head on a fire hydrant wrestling with a kid named Donny Boy. The result was a day-long splitting headache, to the point that I had tears in my eyes. I couldn’t tell my folks, they would’ve made me go to bed. No, I had to sit there and listen to my programs. What kind of hold did these shows have on me? What would force a kid of eleven or twelve to go through all that pain, just to help put another bad guy behind bars? When I asked myself these questions, the only answer that came to me was that it had to be in the writing. Sure there was the music, and the inflections in the actors’ voices. But someone had sat at a typewriter, created a situation; told the actors what to say. And in turn their words had kept me inching closer and closer to the radio, kept my heart beating faster, kept me struggling to identify the culprit, regardless if I had a headache or had to run to the washroom. So, how was it done? My favorite radio programs were crime shows, and fortunately in those days there were at least a half-dozen pulp magazines on the stands at any given time. So, I began to read. I dissected story after story trying to identify the twist and turns the authors were taking me through. Whenever I’d get engrossed in a story and forget to dissect it, I’d read it again to see if I could detect where the author had gotten me to simply enjoy the piece instead of looking at it as a textbook. Somewhere along the way I began to wonder if I could write a mystery story, not so much with the idea of selling anything, but just to see if I could do it. I’d experimented with doing my own comic book, but at that time I had visions of becoming an artist. When I started thinking about trying to write, I started looking for how-to books. I don’t believe I ever read an entire book, but I’d read the chapters on plotting, dialogue, and viewpoint over and over. My turning point came when I was eighteen. I’d tried a few short stories at various magazines without any success. It was okay because my focus was still on becoming an artist. A cartoonist was actually what I was aiming for. I prepared a couple of strips and took them downtown to the Chicago Tribune to show off my handiwork. The editor in charge of the cartoon section showed me some of the artwork he was rejecting. To be kind to myself, let’s just say the stuff was only a hundred times better than what I had brought with me. Cleaner, neater, the artwork itself much, much better. I couldn’t complain. The year before, I’d taken a summer art course at the Chicago Academy of Fine Art, and had picked up a few pointers. However, I figured if I was going to make a go of it as an artist I needed to get back in school. I needed an instructor right at my shoulder pointing out each error I made as I went along. But, if I was going to be a mystery writer, well, I could teach myself how to do it. Maybe that hit on the head as a kid did more than just give me a headache. 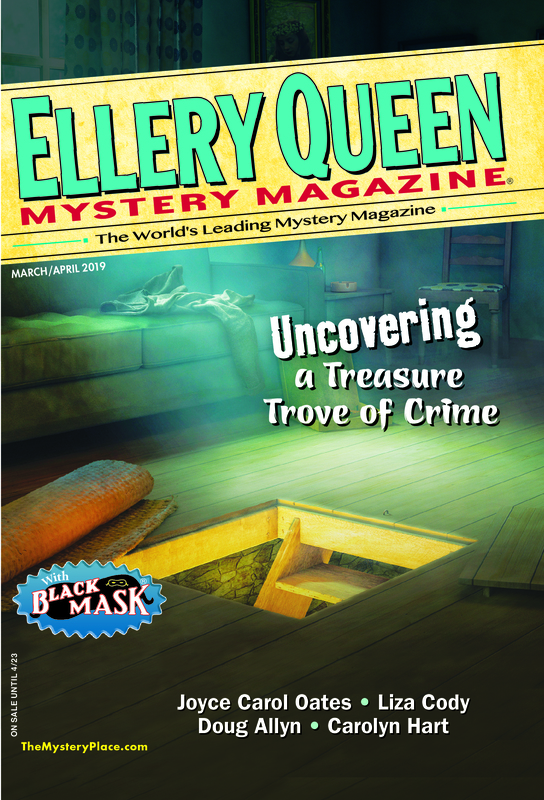 At any rate, twelve years later I sold my first story, “Block Party,” to Ellery Queen’s Mystery Magazine, which appeared in their April 1972 issue. Since “Block Party,” my published works haven’t reached the astronomical level I once thought they might, but I do have two novels and sixty-five short stories to my credit thus far. I’m still writing, so who knows what the final total will be. Okay, now here are the rules that work for me. Another aid I use in individualizing my characters, especially if I’m introducing two or more, is I never describe their features in the same order. Height, color of hair, eyes; figure. That way it’s like going down a check-off list. And doing so, for me, seems to have the result of meshing the characters into one big lump. I may start with character A’s hair, the shape of character’s B’s mouth, the girth of character C’s waistline, and add a little something here and there as I go back to each character through dialogue or observation. How about viewpoint? I usually stick to one person’s viewpoint in a story. The reader sees, hears, feels, and smells everything the narrator experiences. I don’t go into everybody’s head. I have trouble figuring out how that can be done in a mystery piece. The only way I’ve ever handled the All Seeing Eye, or omniscient viewpoint, is to divide the story into segments giving each character their own patch, therefore revealing only what they perceive as true as the story unfolds. I did this in “Woman at the Window,” EQMM June 2002. The story starts in a defense lawyer’s viewpoint waiting for an assistant State’s attorney to arrive before going in to see his client. When they enter the room the story goes into the woman’s viewpoint as she sits at her bedroom window watching children playing outside. She get increasingly agitated with the men being in her bedroom and wishes her husband would arrive to protect her. When the lawyers leave the room and step into the hospital corridor the story goes into the state’s attorney’s viewpoint. He is convinced the woman has killed her husband but has no knowledge of the act. He tells the defense lawyer the state will not be pursuing murder charges, as he looks back into the room at the woman, who is sitting there staring at a blank wall. I could not have told the story differently. I also believe in showing, and not telling. He stood there, eyes wide, mouth partially open, head rocking slowly back and forth. As oppose to: He stood there confused. I think most people read PI and detective fiction to match their skills with the story’s main character. I know I feel a sense of accomplishment when I can pick out the bad guy before the detective does. But, I’m absolutely overjoyed when the detective gets there before I do and points out all the clues that were right there for me to see, but that I’d missed. As for my stories that don’t feature a PI or police detective, or some character that gets put into a position where he has to act like one, I go for the twist ending. For me it’s a matter of directing the story to its obvious conclusion, and then do an about face at the end. And hopefully the reader will say I didn’t see it coming, but now that it has, it makes sense. That’s it. I don’t believe I’ve left anything out. Thanks for taking the time to read this. This entry was posted in Books, Characters, Editing, Ellery Queen, Fiction, Genre, Guest, Publishing, Setting, Story, Writing and tagged advice, character, editing, mystery, private eye, puzzle, story, technique, tips, writing, writing tips. Bookmark the permalink. Excellent advice for short story writers, mystery and other! I have always enjoyed Mr Parker’s stories, but I think this is my first encounter with his nonfiction. Very enjoyable. Percy, what a pleasure to see you here. It’s been many many moons since we last bumped into each other. I hope life is treating you well! Wonderfully informative. I too love crime radio drama. I have never hit my head on the radio but I have been found sitting in a room, everything else forgotten, as I wait for the criminal to be revealed. If my writing ever caused someone else to react the same way I would consider myself a success. Mr. Parker has obviously found his success.